Omron and Actemium present solution for flexible and traceable intra-logistics. 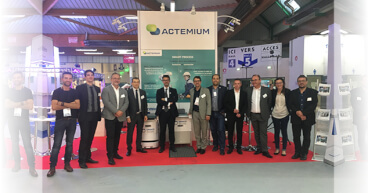 At this year’s SIANE in Toulouse, Omron and system integrator Actemium presented a mobile robotics solution for flexible and traceable intra-logistics. Taking industrial performance to the next step, this mobile robotics solution is a masterpiece of the Future of the Industry plant. Consolidating the three pillars of industrial performance, it ensures quality as transported parts can be traced, stock is optimized as the robots deliver small batches just in time and it is very flexible as the robots can adapt to the changing environment around the operators.